Replant! Check the number of days to harvest on seed packets and compare this number with the last freeze/frost date for your area to get a sense for whether it’s reasonable to replant crops. In many cases, you can still plant beans, beets, carrots, leafy greens, and peas. While you’re at it, consider using season extension strategies this fall. Savor strawberry season! UMaine Extension has resources on freezing and making jam, growing strawberries, and handling, storage, and delicious healthy recipes. Be mindful of ticks. Learn about how to submit a tick for ID, tick species of Maine, tick biology, tick removal, tick management, tick-borne diseases, and see photos of ticks. Add a rain gauge to your garden. Water needs within the landscape often vary, but most newly planted edible and ornamental crops need 1 inch of water per week. Mow lawns at the highest setting and leave clippings where they fall. 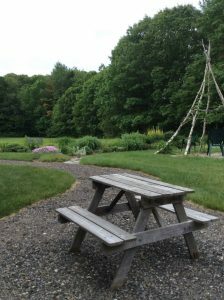 Follow the guidelines in our UMaine Extension lawn bulletins and videos for beautiful and low maintenance green spaces. Harvest slugs. You know it’s been a damp growing season when we suggest harvesting slugs in July. One of the many tricks listed in our UMaine Extension Slug fact sheet is to leave a wide board or some other slug-friendly habitat in the garden overnight. The next sunny morning, lift the board and simply remove all of the unwanted critters at once. A few repeated “harvests” should make a difference in the population and you can keep the beer for yourself. Visit a public garden. Here is a list of many well-known public gardens in Maine. Although it is early in the apple season, a bumper crop of fruit is expected this fall in the southern half of the state. Blossoms occurred in abundance, and pollination by native bees was sufficient to ensure that a large number of apples occurred. 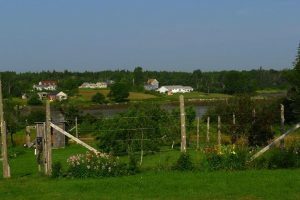 In contrast, orchards in northern Maine generally had sparse bloom and poor pollination because of rain and wind during full bloom. When apple trees have an abundance of fruit, it creates a few problems for the tree. As fruit increase in weight, the large number of apples will bend and break limbs if the weight is more than what the limb can bear. In addition, fruit will compete with each other for the limited resources of photosynthesis so that apples will be small and may have bland flavor at harvest. Where the fruit are extremely abundant, trees will be depleted in energy and will go into the winter in a weakened state. Removing some of the fruit at this time of year will prevent these problems from occurring. “Thinning” or selectively removing apples is generally done this time of year, but can be done anytime of the season up to harvest. 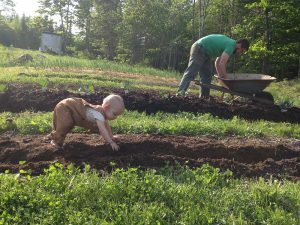 Most gardeners wait until after the “June drop,” which occurs the first week of July in Maine. 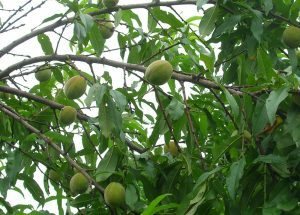 This years’ June drop may entail the drop of a large number of fruit, but additional thinning will benefit tree health. The recommended amount to remove is as many as it takes so that fruit are spaced about 6 to 8 inches along each branch. In some cases, more fruit are removed than are left on the tree. The thinned fruit can be left under the tree to decompose, or can be removed from the orchard to eliminate a possible source of disease and insect pests. 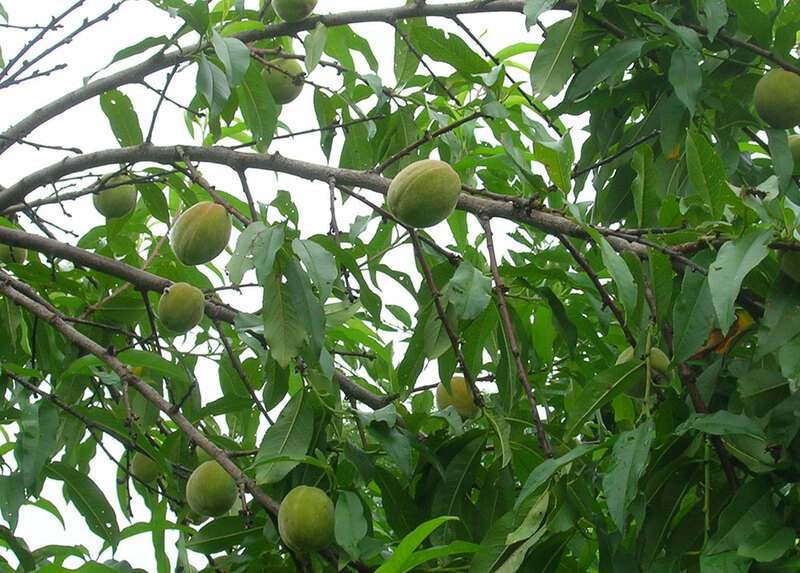 Thin fruit so that they are spaced about eight inches apart along the branch. Plums and peaches will also benefit from thinning when trees bear an abundance of fruit. Peaches should be spaced about 6 to 8 inches apart, the same as for apple. Plums, on the other hand, can be thinned so that they are spaced about 4 inches apart. Temperatures this past winter have killed peach flower buds in many orchards so peach thinning is not likely to be needed this year. Plums have survived the winter in many orchards around the state and may benefit from some thinning. Fruit thinning is typically done by hand and can take as much as one hour per tree for large trees. Tall trees with limbs that are difficult to reach safely from an orchard ladder should be left unthinned as a precaution against falling. 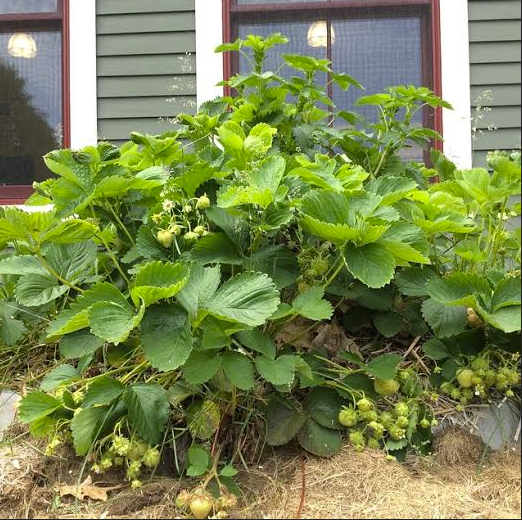 Learn more about fruit thinning and growing fruit trees in Maine. 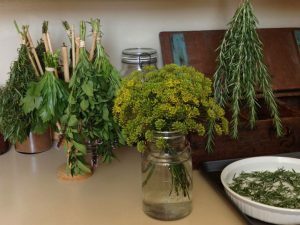 New from UMaine Extension: Bulletin #4275 Let’s Preserve: Dried Herbs! Drying is the easiest method for preserving herbs. Learn the best time to harvest, various drying methods, and more. Please join us at the first ever York County Master Gardener Volunteers “Diggin’ It” Garden Tour. 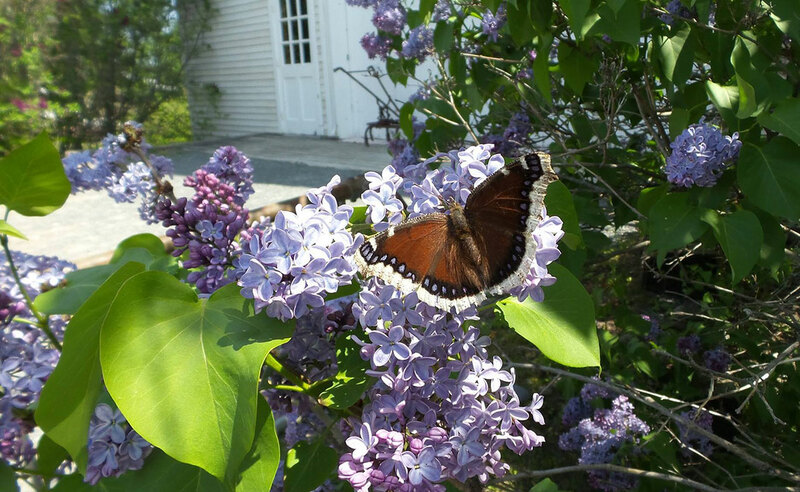 Visit eight distinctive gardens and farms — all owned, managed or created with input from York County Master Gardeners — set along a scenic route winding through South Berwick, Eliot, Kittery Point, and York. When: Saturday, July 25, 10 am – 4 pm; self-paced tour navigable by car or bicycle. We recommend allowing 3-4 hours to visit all the gardens. Tour will take place rain or shine. All ticket sales are non-refundable. 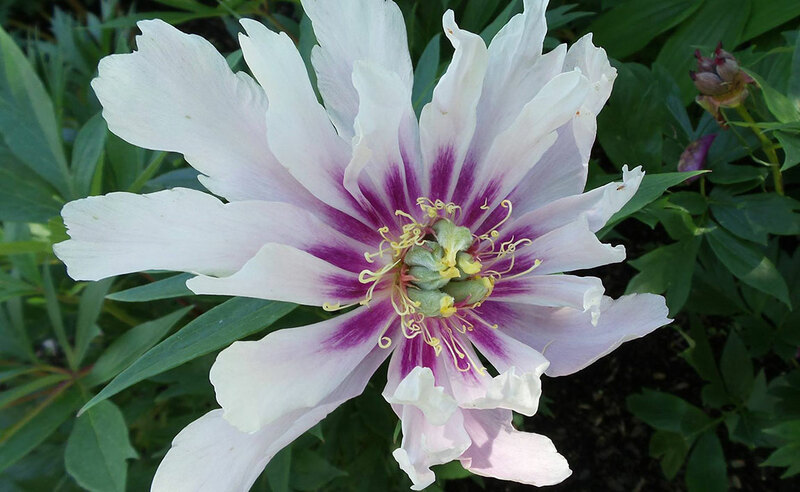 Where: 8 unique gardens in southern York County. Pick up brochures, addresses, maps, and driving directions the day of the tour at one of two locations: Central School, 197 Main Street, South Berwick, OR JayLuna Farm, 10 Fall Mill Ext., York. Tickets: $20. Children under the age of 12 may attend free. Early season crops are coming into full production. What is your plan for this space once the crop is completely harvested? 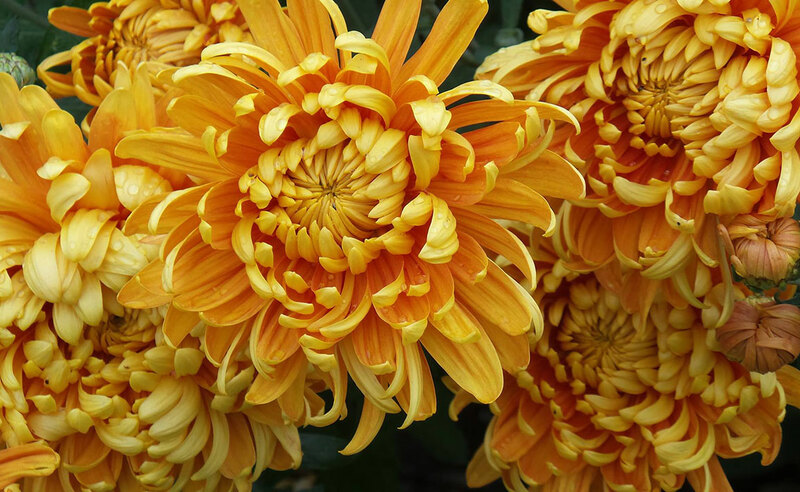 There are several options for home gardeners. Many choose to plant a late season crop, such as carrots and broccoli. Others choose to plant cover crops. Just like in January when you are planning your vegetable seed selection, July is the time to plan your cover crops. Each group provides different benefits. Warm season grasses provide a lot of biomass; warm season broad leafs provide good weed control. Cool season grasses capture excessive nutrients and cool season broad leafs provide nitrogen and break up soil compaction. When using multi species cover crops, choose at least one species from each group. Selection criteria are also multi variant. What is the goal of planting the cover crop: weed control, adding bio mass, bio-fumigant, capturing excessive nutrients or adding soil organic matter? One choice you may consider in the mix is forage radish, a cool season broad leaf. Forage radish quickly develops a deep taproot, which can be 8-14 inches long! Forage radish has been nicknamed the “bio-drill.” The taproot and many fine hair roots are very good at breaking up compaction and capturing excessive nutrients deep below the roots of many vegetable crops. Forage radish is a fall — late August to early September in Maine — seeded brassica that is not winter hardy. 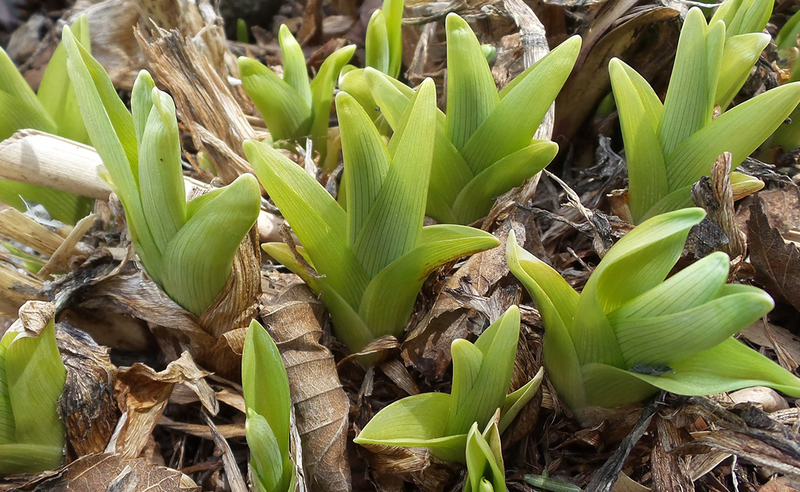 The foliage and roots will decompose before planting crops in the spring. The decomposition of the roots add organic matter to the soil and increase soil porosity. Seeding rate of forage radish is 10-13 pounds per acre if broadcasted (0.3-0.4 pounds/1,000 sq. ft.). Seed is available through local seed companies including Johnny’s Selected Seeds and Fedco. If you are a gardener who likes to try different things, forage radishes are an interesting and effective cover crop, providing multiple benefits to the garden soil. Remember, soil is meant to be covered! Read more in Radishes — A New Cover Crop for Organic Farming Systems by eXtension. 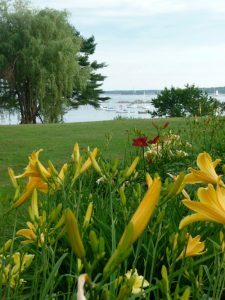 The UMaine Extension Androscoggin and Sagadahoc Counties Master Gardener Volunteers training program has been held in various locations in the two counties for the past few years. The idea is to allow maximum accessibility for participants and to help jumpstart existing or new projects in that location. The 2014 training was held at the Good Shepherd Food Bank in Auburn, where there is now a re-vamped demonstration garden in front of the building where Master Gardener Volunteers and Food Bank volunteers have created models of food production that local food pantries can observe when they come to pick up from Good Shepherd. The 2015 training moved to the other end of the two-county range to the Topsham Public Library, where there was space, enthusiasm, and lots of opportunity for the library to expand their outdoor education programs. Behind the Topsham Public Library is a large lawn sloping toward a woodland strip along the Androscoggin River. Bernardo Feliciano (Master Gardener Volunteer class of 2009) envisioned this to be a place where other Master Gardener Volunteers, local business people, and artists could create a palette of projects highlighting their work, while at the same time engaging and building community, and providing an educational setting to enhance the library’s mission. It is Bernardo’s energy, along with the blessings of an extremely open-minded library director, Susan Preece, that allowed the training and all of the projects below to move forward. This is the oldest project at the library. It was installed as a Girl Scout project and is maintained by Dana Cary (Master Gardener Volunteer class of 2010), with help from other volunteers. It is filled with plants such as anise hyssop (Agatasche), dogwood (Cornus), and summersweet (Clethra). Children’s Garden. Photo by Bernardo Feliciano. This perennial garden was installed in 2011. Based on a request from the children’s librarian, the theme of the garden was loosely tied to the Children’s book Planting a Rainbow, by Lois Ehlert. The garden surrounds a spiral path built as a Boy Scout project. 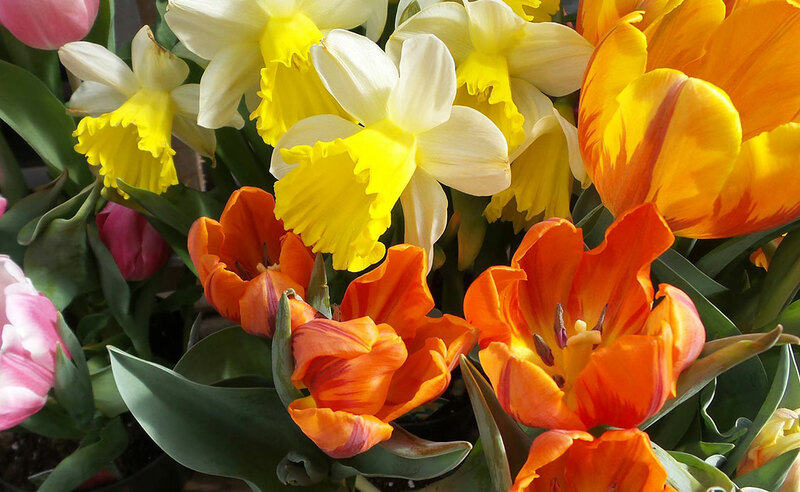 The colors in the garden start with yellows and oranges, move through reds and pinks and greens and whites, to end with purples and blues. 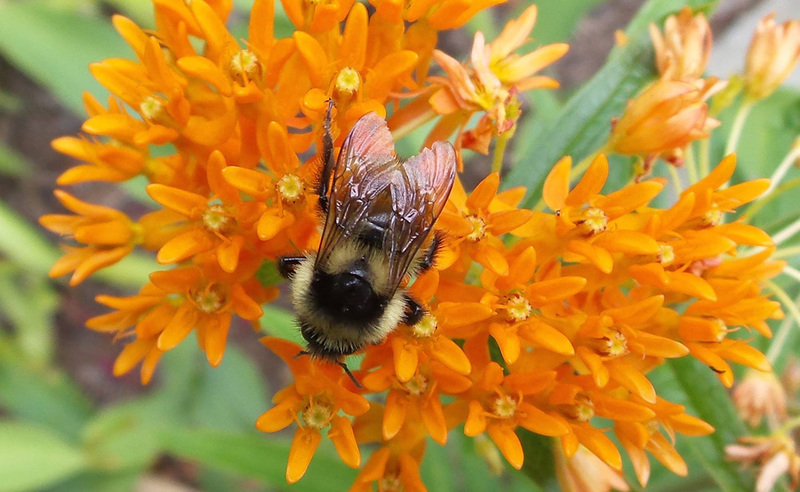 Plants in the garden were selected to appeal to children’s senses and curiosity with interesting scents (e.g., lavender, catmint, prairie dropseed), unusual shapes (e.g., globe thistle, verbascum), and attractiveness to hummingbirds and insects (e.g., butterfly weed, agastache). Plants were also selected to demonstrate that gardens can be lush and beautiful with a relatively low maintenance design. 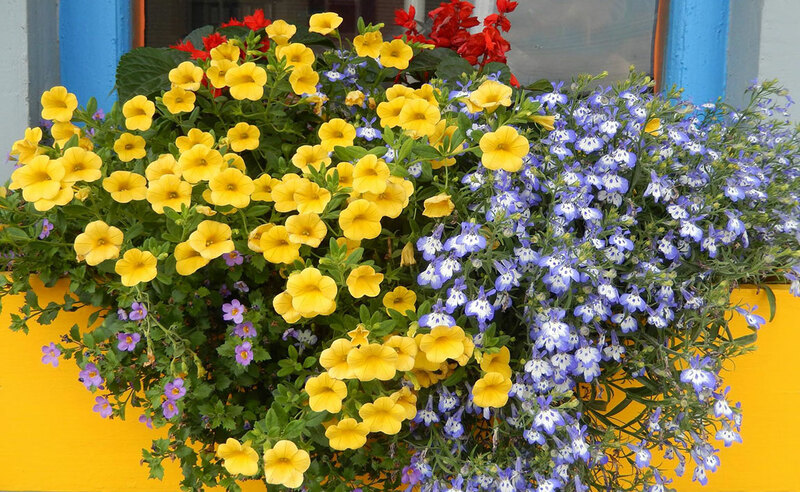 This includes no watering after the first year, heavy mulching to suppress weeds, and no pesticide applications. 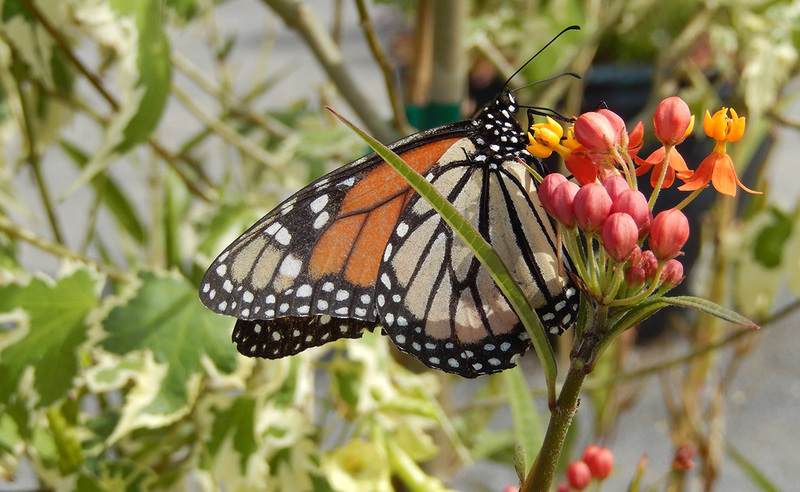 Since installation, the Children’s Garden has hosted two weddings, a memorial service, adult ed painting classes, and numerous children’s activities such as nature journaling. The basic garden design, install, and ongoing maintenance were done by Sarah Wolpow of SweetFern Garden Design, with many hours donated by Sarah (Master Gardener Volunteer class of 2009), Bernardo Feliciano (Master Gardener Volunteer class of 2009), and other Master Gardeners and library volunteers. Hugel Mound. Photo by Bernardo Feliciano. A hugel mound is basically a pile of organic matter over a woody base such as tree logs. To create a hugel bed, one starts with cut up branches or logs, piles any and all available organic material on top, covers with a mulch, and plants into the top or sides. As the wood below decays it provides nutrients to the growing plants and becomes a storage reservoir for water during dry spells. It also forms the basis for an explosion in the activity of soil mycorrhizal fungi, which are known to dramatically improve the health of plants grown nearby. Eventually the entire pile collapses into a heap of fabulous, dark topsoil. Soil rich in organic matter is one of the most promising sinks for carbon on the planet. The hugel mound at the library was built in the spring of 2014. It was created over a base of logs and branches, coffee grounds from the local Starbucks, chicken coop bedding, cuttings from the children’s garden, sod, and leaves. After being very thoroughly watered, it was topped with a layer of newspaper and straw. Four small holes were cut into the newspaper and four small squash plants were inserted. 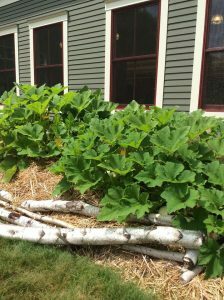 They were watered once during the summer, and produced an astounding quantity of squash. Plans are to plant more squash in the 2015 season. Strawberry Spiral. Photo by Bernardo Feliciano. The strawberry spiral was installed by library volunteer Sue Ham and others, in the spring of 2014. A mound of compost and soil was lined with a spiral of rocks, around which were planted strawberries. This year, without supplemental water, and almost no rain, the spiral is covered with huge berries! Master Gardener Volunteer Sarah Wolpow received a seed grant this spring from the Master Gardener Volunteer program to start an Edible Forest Garden. The idea is to mimic the architecture of a New England forest with a tall canopy, a mid-level layer, a shrub layer, and a groundcover layer. However, instead of the usual white pines, etc., plants are chosen that provide food for people. 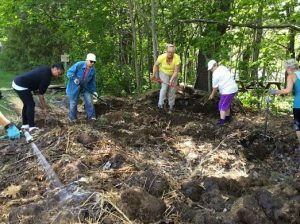 With much help from other Master Gardener Volunteers, preparation of the ground for the new planting along the woodland edge has begun. 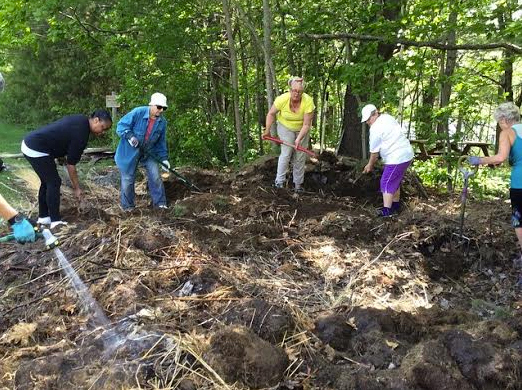 Brush piles that had accumulated on the library grounds were cut up, and sod that had been dug up from some new pathways and piles of organic material generated by the last few years of the children’s garden were added. 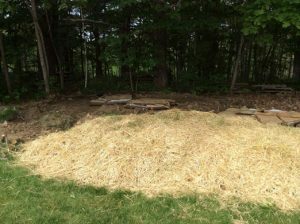 This will be topped with cardboard and straw and left alone to decompose until planting begins in fall. Edible Forest Garden. Photo by Bernardo Feliciano. Newly minted Master Gardener Volunteer Eli Arlen is planning to install a children’s tea garden containing plants that can all be used for making tea, including lavender, mint, stevia, and many others. Savor the Season is a weekend event devoted to learning the latest, USDA-recommended methods and techniques of home food preservation. 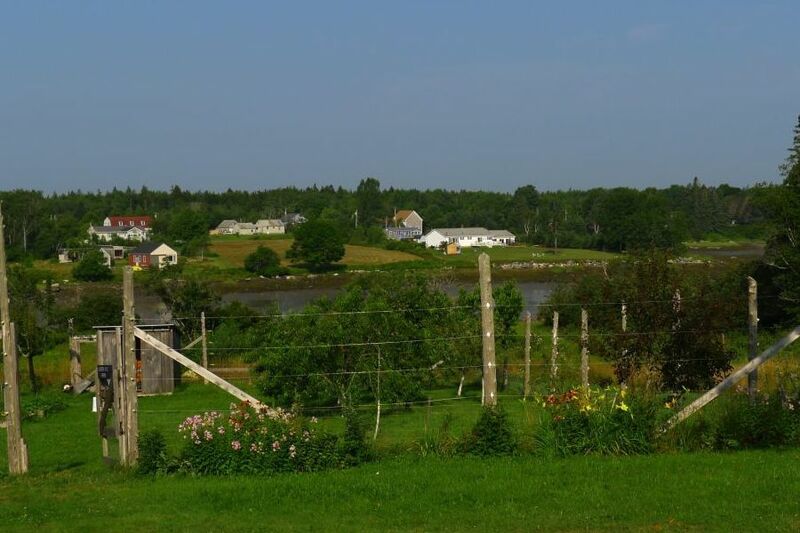 The focus will be on using local, seasonal ingredients and produce from the gardens and orchard at Blueberry Cove Camp and other local purveyors. The weekend features three educational programs, two on Saturday and one on Sunday morning. These programs will include topics and demonstrations which range from making jam to drying fruits for leathers to canning salsas. There is a social hour to meet and gather with other members of the group before dinner on Friday night and Saturday night. Meals include breakfast and lunch on Saturday and Sunday. A highlight of the weekend, these homemade meals will feature locally grown, raised, and produced fruits and veggies, meats, cheeses, breads, and other seasonal delights. Registration for Savor the Season is $325, which includes all educational programs, meals, and two nights lodging. Due to the nature of this weekend event, which includes perishable supplies and ingredients, and that this is an important fundraiser for Blueberry Cove Camp, registration fees are non-refundable and non-transferable. Relishes and pickles are a great way to enjoy summer’s bountiful array of fruits and vegetables long after the season is over. Pickling should not just be limited to cucumbers. Peaches, green tomatoes, and green beans can also be pickled for a delightful addition to any meal. Spiced apples, crabapples, and corn, pepper and pears can be used to make relishes. Quick-process pickled fruits and vegetables are easy to make and the many flavor combinations can add a lot of variety to meals. 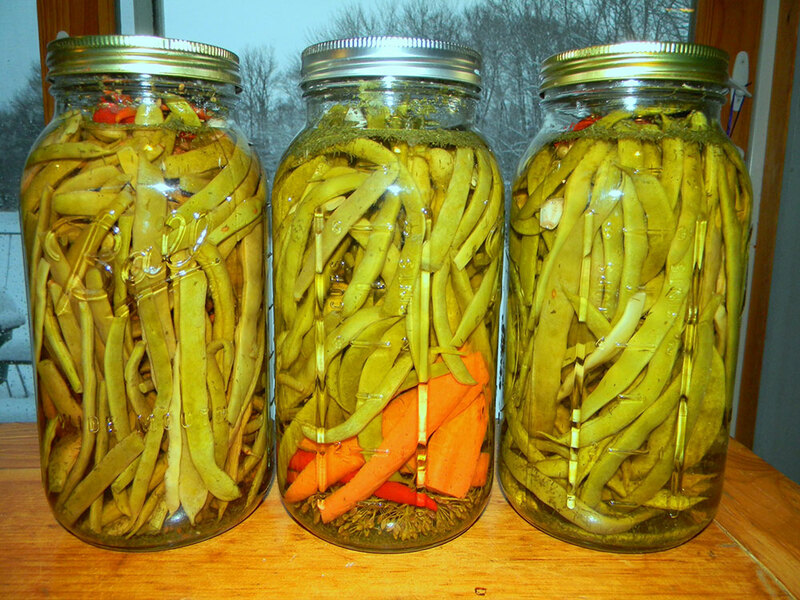 Talent in the kitchen is not a requirement for pickling. Just follow several simple rules for delicious pickled products. Ingredients are very important to the process of pickling. First, make sure to use only good quality fresh fruits and vegetables. This is especially important because if you do not start with quality ingredients, your product will not be as successful. Fresh whole spices are also important in some recipes to give good flavor and prevent darkening of the pickled product. Salt is an integral part of many pickling processes and flavor twists. Canning or pickling salt that does not contain iodine or non-caking material is ideal. Use apple cider or white distilled vinegar, but the pickles may taste best with the recommended type in the recipe. Apple cider vinegar is milder and offers a different flavor note than white distilled vinegar. Any vinegar should be at least five percent acetic acid. Read every recipe carefully. There is a reason for each step, and cutting corners may compromise the quality of the product or make it unsafe to eat. Make sure that each recipe used is modern, up-to-date, and kitchen-tested, and that all pickled products to be stored out of the refrigerator are processed in a boiling water canner for the recommended length of time. Stainless steel, glass, or unchipped metal pans should be used when heating pickling liquids. Aluminum can be used if the brine will only be in it a short time. Some metals such as copper and brass can react with acids or salts to create discoloration or undesirable compounds. 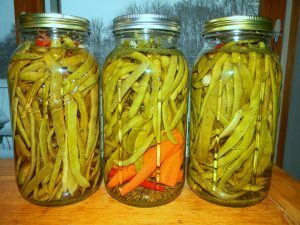 Finally, make sure to store finished, canned pickles in a cool, dark place, because heat and light may reduce color and quality. Following these simple guidelines will ensure a higher chance that pickling will be successful. For more information on pickling, check out UMaine Extension bulletin #4044, Let’s Preserve Pickles. Additionally, many tested, safe pickle recipes can be found in So Easy to Preserve, available through the University of Maine Extension. Check for other tested recipes at the National Center for Home Food Preservation Education. Adapted from National Center for Home Food Preservation.